A crew from Sargent Corporation does site preparation Monday as part of a project to renovate the track around Old Town High School's Victory Field. 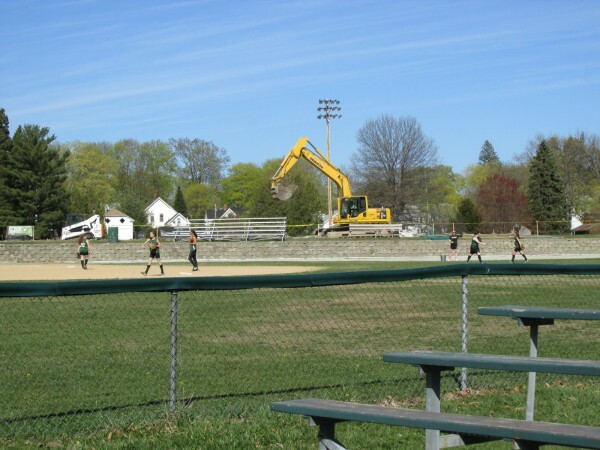 The Old Town High School JV softball team goes through pregame warmups Monday while a crew from Sargent Corporation (rear) works on the track around Victory Field. Members of the Old Town High School track and field team run downhill along the driveway behind the school as part of their practice regimen on Monday. 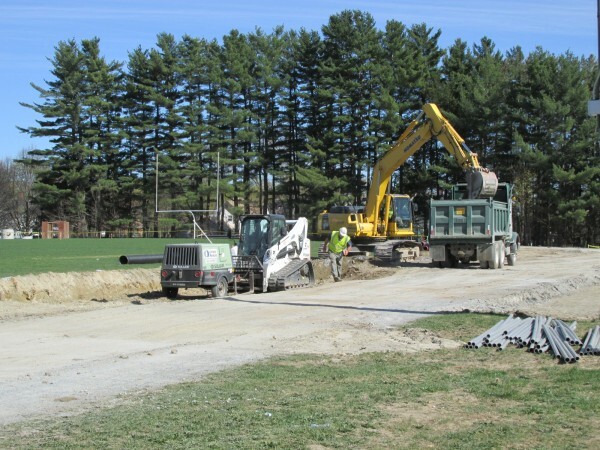 The area on and around Old Town High School's outdoor track is under construction this spring as a new, eight-lane, all-weather track and other upgrades are planned for the facility. Members of the Old Town High School outdoor track and field team take part in a workout under the watchful eye of head coach Rod White on Monday afternoon. The Coyotes are sometimes practicing on the asphalt driveway behind the school while their track is being renovated. 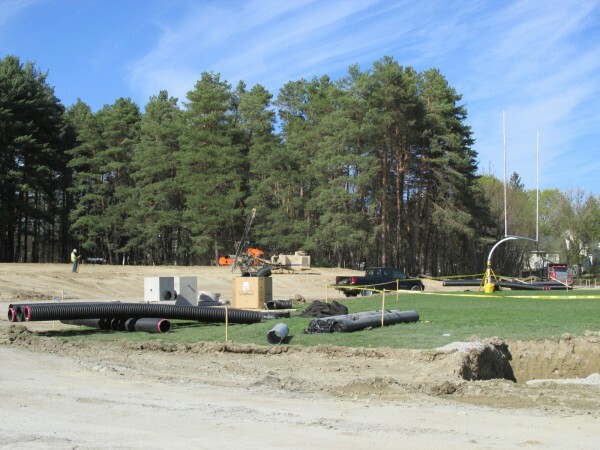 OLD TOWN, Maine — As members of the Old Town High School track team ran laps on the asphalt driveway behind the school Monday afternoon, a crew from Sargent Corporation was digging up the earth around Victory Field, some 250 yards away. By next fall, coach Rod White’s track and field teams will be training on an eight-lane, all-weather rubberized track, rather than on the tar. Spearheaded by the RSU 34 Education Foundation’s Restore the Pride Committee and supported by businesses and residents in Old Town, work is moving forward on the first two phases of a three-part $1.5 million renovation project involving Old Town High School athletic facilities. “It’s an economic boost for the community. We’re going to have one of the premier tracks in the area,” said Mark Graffam, the president of the RSU 34 Education Foundation, the nonprofit group that has helped bring the first part of the project to fruition. The Restore the Pride Committee has been working on planning and fundraising the renovations for the last six years. Graffam, a retired firefighter who also is Old Town’s boys soccer coach, said it has been a long process. Graffam pointed out the project will be entirely privately funded, which means no added tax burden on Old Town residents. White pointed out the new facility will come during a time when RSU 34 is facing substantial budget cuts. White, who previously was part of three or four failed groups that sought to upgrade the facilities, admitted he was skeptical it would happen — until he saw the construction equipment in action. It took some time, but the committee found the right mix of people at the right time. “When Joe Cyr and Stan Peterson came on board, it just took off,” White said. Cyr and his wife, Sue, the owners of John T. Cyr and Sons Bus Line, made a substantial donation toward the effort. Peterson, a teacher at Old Town High, helped procure more financial support with his connections in the community. That included negotiating with Sargent Corp, which has donated the ground work. White said that accounts for about two-thirds ($440,000) of the approximately $650,000 needed to complete the first two phases. “It makes a huge difference having a company with the respect that they have doing everything,” said Graffam, who also credited Old Town athletic administrator Brett Hoogterp for his contributions. “He has been doggedly pursuing smaller companies and individuals and has gotten us some good prices,” he added. Phase I incorporates the site preparation and track installation, while Phase II will bring new bleachers and a press box at the football/soccer field, and new scoreboards for Victory Field, and the baseball and softball facilities. Graffam said much more money must be raised to cover the first two phases. The final piece, which will be the installation of a synthetic playing surface on Victory Field, will cost an estimated $855,000. In addition to the efforts of Sargent Corp and the Cyrs, the RSU 34 Education Foundation also earmarked funds for the project. White has been coaching track and field at Old Town since 1982. During that time, the existing six-lane, crushed-stone track has been reduced by wear and tear to 4½ lanes — of mud or hard-packed dirt, depending on the season. As a result, the Coyotes have practiced wherever they could, including in the school parking lot, at neighboring Orono High School and even at Hampden Academy. Once the mud dried up in the spring, Old Town usually was able to use its own track, where there haven’t been any home meets for three decades. With a state-of-the-art facility on the horizon, there is another dynamic White likes even more. White praised his athletes for adapting to a variety of practice venues and conditions, including running the oval driveway around the adult education offices. “He does a good job modifying our workouts so that they can benefit us without hurting us on the tar,” said Jackson, who won’t miss practicing on the tar, or on the slippery rocks of the old track. “The kids don’t even know it, but they’re actually getting hill work in at the same time,” White said of the sloping asphalt loop. White is excited about being able to use the new track for his future summer programs, which often have more than 100 participants. Old Town also will be purchasing all new equipment for the track, including hurdles, a pole vault bar and padding. “There’s excitement in the community and the buzz of something positive that’s happening,” Graffam said. Anyone who wants to find out more about the renovations or donate the project may go to www.rsu34.org, click on the education foundation link and then click on the Restore the Pride link. Graffam said donors can contribute using PayPal. All contributions will be tax-deductible as Restore the Pride is completing the legal process of becoming a nonprofit.